Chuck Jackson is one of Canada’s best singers and entertainers, a two-time winner of the top blues vocalist of the year. The co-founder of the Southside Shuffle in Port Credit is one of Canada’s best performers, serving up a heaping helping of blues favourites, including the hit single, Flip, Flop & Fly. The long time lead singer of the Downchild Blue Band will be front and centre stage with band mates Chuck Tyler and Patrick Carey at the fifth annual “A Night in the Lane” in downtown Brampton on Thursday, Sept. 22 (6 to 9 p.m.). 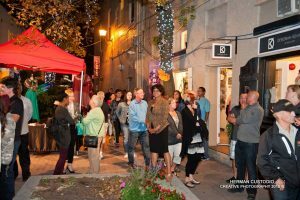 The night of music, food, fun and meet and greet with local retailers of downtown Brampton, takes place in McArter Lane (between Main St. and the Nelson St. parking garage). Enlivening public spaces is part of Brampton BIA’s mandate, and A Night in the Lane has signed one of the country’s best performers to ensure that happens. Alongside Deborah Kenney Jewellery and Stems Floral Studio, A Night in the Lane is sponsored by the Downtown Brampton BIA and the City of Brampton. .
For more, visit www.downtownbrampton.ca or our Facebook page at www.facebook.com/downtownbrampton. To find out more about Jackson, go to www.chuckjackson.com.